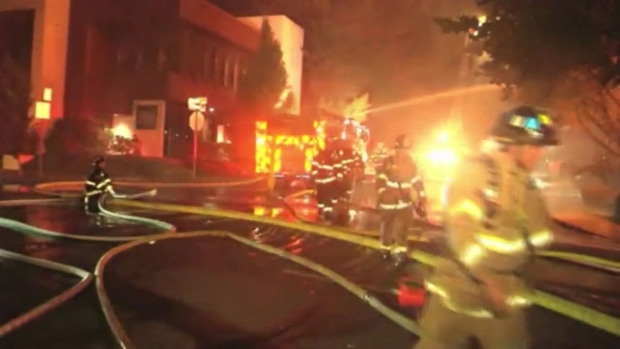 Fire destroys downtown businesses. Bob Redell reports. Sky-high flames early Thursday decimated a Lafayette building that housed multiple businesses and the Chamber of Commerce. 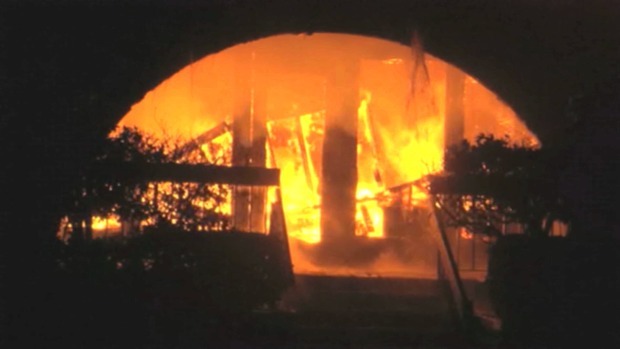 A three-alarm fire — among the largest in the East Bay city's history — sparked around midnight at 100 Lafayette Circle. Responding firefighters encountered a very large blaze that was causing the building to collapse. So they immediately went on the defensive. "We went immediately to a third alarm," Fire Marshal Robert Marshall said. Having lost the building before they even arrived at the scene, all firefighters could do was keep the flames contained and stop them from spreading to the apartments nearby where people like Kaitlin Liffson had been asleep. "It was very reassuring how quickly everybody took charge," she said. "The people at the apartment started banging on doors." The "community action" helped everyone get to safety, said Liffson, choking up. Firefighters that arrived on the scene encountered a very large blaze that was causing the building to collapse. So they immediately went on the defensive. By about 1 a.m., fire officials announced on Twitter that the blaze was contained and that crews would be on scene "for a long time," cleaning up the charred mess. 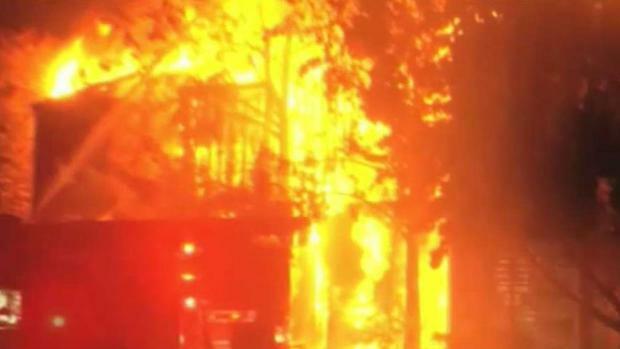 Damage was estimated at around $1.1 million, according to the Contra Costa County Fire Department, and the building was a "total loss." The structure also housed a nail salon, a public accountant's office and the popular La Finestra Ristorante, whose owners cried as a firefighter told them Thursday that their eatery was no more. The restaurant owners said they poured their heart and soul into the place. "My boys worked there, my husband's life was there," Parinaz Assadi said. "I'm there whenever I can, and now it's gone. ... It was more than a business; it was like family. Everyone knew each other." Assadi, whose husband also is the chef, said her husband and a busboy were the last ones to leave Wednesday night. "He was here until 10:30," she said. "They cleaned the restaurant, washed the carpet, and they left. Nothing suspicious, nothing wrong." Marion Iles, who ran the tax and accounting firm on the second floor of the building, said she didn't know how to recover all the lost accounting files. "I'm pretty shook up, but we'll get back," she said. When asked how she planned to proceed, Isles said, "I don't know." Marta Chavalas, who owned the nail salon, broke down. "Oh my God. Oh my God. Oh God," she said. Struggling to verbalize her feelings at the sight of the scorched and mangled structure, she admitted, "What the building means to me is my livelihood." A former Chamber of Commerce president wondered how the organization will move forward. "When you look at everything that's come out from this — the art and wine, the res run — it's a big impact for us," Larry Duson said. Nearby apartments were evacuated because of radiant heat from the fire and propane tanks exploding at the restaurant, fire officials said. There were no reports of injuries, according to fire officials. The cause of the fire remains unknown, Marshall said. 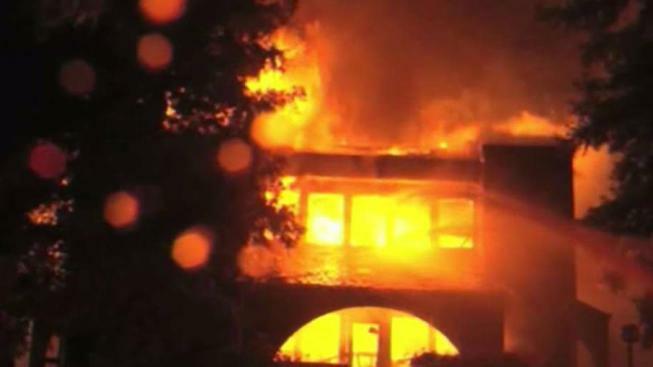 As of Thursday evening, the building posed too much of a hazard for fire inspectors to enter. In January, a winter storm uprooted a large eucalyptus tree that stood on the same property. It landed on cars in the parking lot, crushing them. Sky-high flames early Thursday decimated several Lafayette buildings, including the Chamber of Commerce. Bob Redell reports.